Harvick, a nine-time Phoenix winner, circled the reconfigured 1-mile track in 25.386 seconds to run the fastest lap in the three-round knockout qualifying session at 139.340 mph to edge fellow Playoff driver Chase Elliott (139.152 mph) for the top starting spot in Round of 8 elimination race. 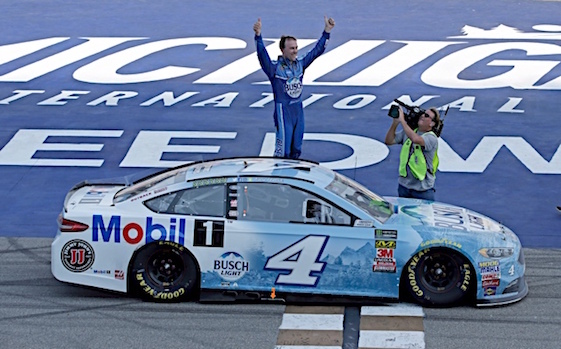 Harvick lost 40 points and the services of crew chief Rodney Childers and car chief Bob “Cheddar” Smith for the final two races of the season for an infraction involving the placement of the rear spoiler on last Sunday’s race-winning car at TMS. Harvick enters Sunday’s race (2:30 p.m. ET on NBC, MRN and SiriusXM NASCAR Radio) with a three-point edge over Stewart-Haas Racing teammate Kurt Busch, with three of four berths in the Championship race still on the line. Harvick had veteran Tony Gibson on his pit box in lieu of Childers. “Everyone went smooth,” said Harvick. “I think, as you guys are quickly figuring out, it’s more about people than it is about cars. Though Elliott posted his best qualifying effort of the Playoffs so far, he seemed disappointed with his second-place starting position. Playoff drivers Kyle Busch and Joey Logano earned the sixth and ninth spots on the grid, respectively, but four Playoff drivers failed to advance to the final round. Clint Bowyer and Aric Almirola, both in must-win situations, will start from the 16th and 18th positions. (4) Kevin Harvick (P), Ford, 139.340 mph. (9) Chase Elliott (P), Chevrolet, 139.152 mph. (17) Ricky Stenhouse Jr., Ford, 139.007 mph. (12) Ryan Blaney, Ford, 138.867 mph. (88) Alex Bowman, Chevrolet, 138.739 mph. (18) Kyle Busch (P), Toyota, 138.707 mph. (20) Erik Jones, Toyota, 138.344 mph. (42) Kyle Larson, Chevrolet, 138.259 mph. (22) Joey Logano (P), Ford, 138.254 mph. (11) Denny Hamlin, Toyota, 138.249 mph. (21) Paul Menard, Ford, 137.889 mph. (2) Brad Keselowski, Ford, 137.667 mph. (78) Martin Truex Jr. (P), Toyota, 138.339 mph. (41) Kurt Busch (P), Ford, 138.180 mph. (3) Austin Dillon, Chevrolet, 138.069 mph. (14) Clint Bowyer (P), Ford, 137.878 mph. (6) Matt Kenseth, Ford, 137.767 mph. (10) Aric Almirola (P), Ford, 137.720 mph. (24) William Byron #, Chevrolet, 137.604 mph. (48) Jimmie Johnson, Chevrolet, 137.541 mph. (1) Jamie McMurray, Chevrolet, 137.531 mph. (31) Ryan Newman, Chevrolet, 137.342 mph. (34) Michael McDowell, Ford, 136.815 mph. (47) AJ Allmendinger, Chevrolet, 136.529 mph. (37) Chris Buescher, Chevrolet, 136.664 mph. (19) Daniel Suarez, Toyota, 136.529 mph. (32) Matt DiBenedetto, Ford, 135.916 mph. (13) Ty Dillon, Chevrolet, 135.767 mph. (95) Regan Smith, Chevrolet, 135.649 mph. (43) Bubba Wallace #, Chevrolet, 135.542 mph. (38) David Ragan, Ford, 135.267 mph. (00) Landon Cassill(i), Chevrolet, 134.158 mph. (15) Ross Chastain(i), Chevrolet, 133.482 mph. (72) Cole Whitt, Chevrolet, 133.328 mph. (23) JJ Yeley(i), Toyota, 133.284 mph. (97) Tanner Berryhill, Toyota, 132.202 mph. (66) Timmy Hill(i), Toyota, 131.114 mph. (7) DJ Kennington(i), Chevrolet, 130.124 mph. (51) Cody Ware, Chevrolet, 0.000 mph.